The £1bn Northern Hub and North-West Electrification programme is underway in the north of England to improve connectivity, journey time and capacity. Image courtesy of Network Rail. The Ordsall Chord will directly link the Manchester Piccadilly, Oxford Road and Manchester Victoria stations. Image courtesy of Network Rail. Manchester Victoria station is undergoing a £44m redevelopment as part of the project. Image courtesy of Network Rail. 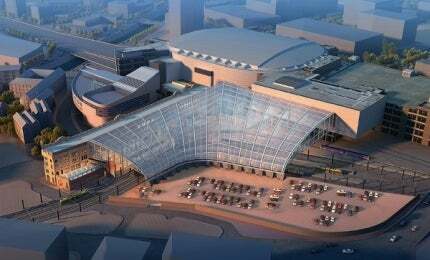 Manchester Victoria station will receive a new state-of-the-art roof installed with ETFE panels. Image courtesy of Network Rail. Manchester Piccadilly station will be provided with two additional platforms and a wider railway through central Manchester. Image courtesy of Network Rail. The project also includes the electrification of more than 350km of railway in north England. Image courtesy of Network Rail. The first of a new fleet of 20 electric trains for the Liverpool Lime Street to Manchester Airport station route made its maiden journey in March 2015. Image courtesy of Network Rail. The Northern Hub and North-West Electrification programme constitutes a series of upgrades to the railway in the north of England, UK, to provide better connectivity, faster journey times and improved capacity. The £1bn ($1.5bn) project by Network Rail is expected to increase the number of passenger train services across the region by 40%, allowing up to 700 more trains to run each day. The upgrades will enable 3.5 million extra passenger journeys a year and transportation of 44 million more passengers annually. It will also contribute economic benefits worth more than £4bn to the region. Works on the project began in 2013 and are scheduled to be completed in 2019. The project will develop faster and more frequent rail services from Manchester to Liverpool, Leeds, Sheffield and Newcastle. It will also involve large-scale electrification, a new railway link in Manchester city centre, alteration of alignment at key stations, and station improvements. The £600m ($896m) Northern Hub project was officially launched in 2014 and is designed to improve medium-distance connections to and across Manchester. It will also provide capacity for local services in Manchester, Liverpool and Leeds. "The project will develop faster and more frequent rail services from Manchester to Liverpool, Leeds, Sheffield and Newcastle." Two new platforms will be built at the Manchester Piccadilly station ,which, along with the new railway section, will allow more trains to run through central Manchester and offer more direct train services across the north. The new Ordsall Chord railway section will be built by late 2016 to directly link Manchester’s three main stations. The viaduct will connect Manchester Piccadilly, Oxford Road and Manchester Victoria stations, and remove a bottleneck to the south of Piccadilly station. This will free up space on the network for improved connection to the north, as well as new direct services through Manchester city centre to Manchester Airport. New tracks will be laid on the line between Leeds and Liverpool and between Sheffield and Manchester to allow fast trains between major towns and cities. The number of trains travelling through Manchester will increase from 12 to 16 an hour in each direction. Two new fast trains will run every hour between Manchester and Liverpool, reducing the journey time by 10min to 15min. The number of fast trains an hour between Leeds and Manchester will be increased from four to six, and the journey time will be reduced by approximately 10min. The journey time to Sheffield and the East Midlands, Chester, Bradford, Halifax, Hull, Newcastle and the north-east will also be reduced. In addition to two new elevated platforms with canopies at Manchester Piccadilly station, Network Rail also will widen the existing viaduct through the city towards Oxford Road station. At the Oxford Road station, the existing railway will be widened in a north-western direction over Whitworth Street West, and platforms and signaling will be reconfigured to accommodate longer trains. A fourth platform is being built at Manchester Airport train station and is due for completion by the end of 2015. The project also involves a £44m ($66m) transformation of Manchester Victoria station into a vital transport hub by 2015. A new brighter concourse will be built with ETFE panels installed on the roof. The £400m ($597m) North-West Electrification programme will electrify more than 350km of railway to provide better and eco-friendly services across the north of England. Glasgow Subway in Scotland is currently undergoing a modernisation programme that began in July 2011. The project will be delivered between 2013 and 2018 in phases. The first phase involving 25kV, 50Hz overhead electrification between Manchester and Newton-le-Willows was completed in December 2013, enabling electric trains to operate between Manchester Airport and Scotland. It was followed by the electrification of the route between Newton-le-Willows and Liverpool Lime Street. The first electric train between Liverpool Lime Street and Manchester Airport station started service in March 2015. Other electrification work will include the route from Huyton to Wigan, Preston to Blackpool, and Manchester Victoria to Preston. The route between Manchester, Leeds and York will also be fully electrified by December 2018, and linked with the electrified lines at Leeds and York. A fleet of 20 Class 319 Electric Multiple Units will operate between Liverpool and Manchester via Newton le Willows on the newly-electrified route. The four-car EMUs were refurbished by Knorr-Bremse Rail Services at Wolverton Works. Parsons Brinckerhoff is providing programme management and multi-disciplinary rail engineering design services for the project. Major infrastructure works are being delivered by the Northern Hub and Electrification Alliance (NHEA) comprising Network Rail, Balfour Beatty Rail, Siemens, Amey Sersa and Skanska BAM. Balfour Beatty was awarded a contract by Network Rail to undertake design and installation of all electrification equipment for the Liverpool-Manchester, Manchester-Preston-Blackpool and Manchester-Stalybridge routes. The scope of work also includes significant power distribution works, and associated telecommunication and SCADA installation. Skanska and Bam Nuttall partnership won the civil work contract for the project. The scope of work includes the construction of the Ordsall Chord. Siemens is undertaking the signalling works while Amey Sersa will be responsible for the switches and crossings renewals.